Solidarity with All Grand Jury Resisters! In late July of 2012, our friend Steve received a phone call from a man identifying himself as a FBI agent. He was told that a subpoena had been issued for him to appear before a federal Grand Jury investigating the vandalism of the Kenzo Nakamura Court of Appeals*. This phone call happened in conjunction with three other people being served subpoenas in Olympia and Portland, as well as house raids in Portland. Although Steve is a known anarchist in the Northwest, who has been subjected to state harassment before, up until this moment he has not been served or indicated as a suspect of the ongoing Grand Jury investigation targeting anarchists. His life has been severely impacted by the course of events. He has made the choice to leave his former life behind in order to resist the Grand Jury on his own terms. This means that Steve has gone without face-to-face contact with his family, friends, and loved ones for many months. The investigation and subsequent repression is still very much alive even though former prisoners, Maddy, Matt and Kteeo are now out of prison. The potential for criminal indictments remains a real possibility. Also, the effects of imprisonment and future threats of going back to prison, which could happen if any of the three are charged with criminal contempt, are not something that ends once one has left the prison walls behind. While Steve has been doing his best to adjust to life in a new place, it has not been an easy transition. He is in a really rough spot right now, being thousands of miles away from his home and not knowing when he will be able to return. He has already been physically and verbally harassed by the state forces in his new location, and is having a hard time finding employment due to not having status and language barriers. At the same time, he has been doing his best to keep his spirits high and is grateful for all the support and solidarity he has received so far, and for the new friends he has made. The fact remains that life inside capitalist society is expensive, and at this point he has no income whatsoever. Please consider donating to Steve so he can take care of his rent, bills, transportation costs, and everything else this life forces us to pay for. As little or much as you can, anything helps. 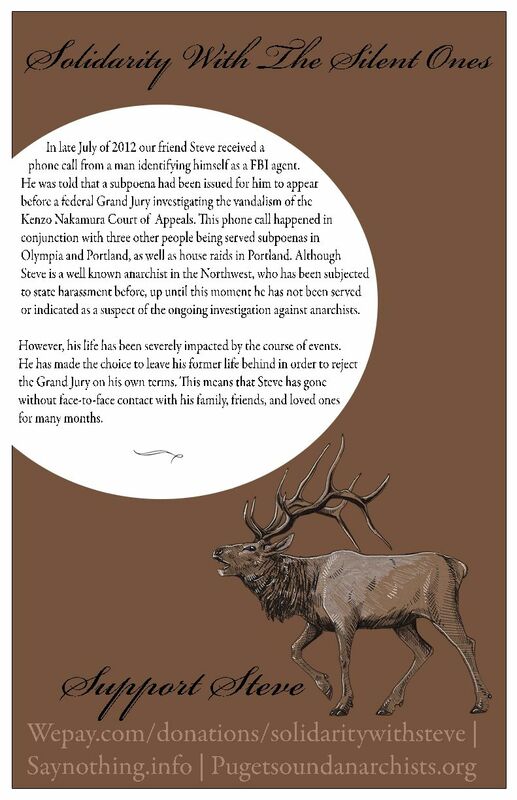 *It is important to note that Steve stands in solidarity and complicity with all those accused of damaging the Kenzo Nakamura Court House. Support Steve is powered by	WordPress 5.1.1 and delivered to you in 0.348 seconds using 121 queries.